You've created your projection tables and associated them with policies and now you are asking, how do I use the results? In this article, you'll learn how to look into your projection data to streamline and grow your agency. Use commission projection reports to forecast future revenue. Select the Actual vs. Expected report to find policies where the actual commission is outside a threshold of expected commissions. Reports give you insight to help make decisions by presenting you the data you need. 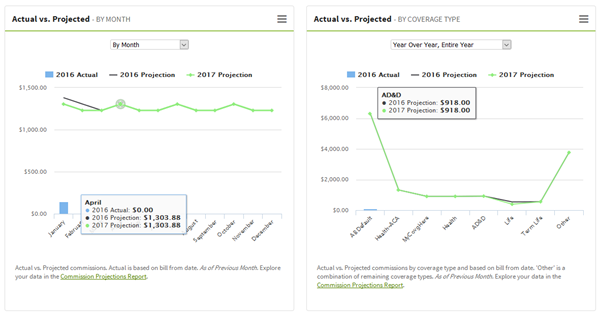 To help your agency, there are predefined reports to help you understand projected commissions and the accuracy of your actual vs. expected commissions. On a day to day basis, as you are working on policies, you may only need to see data on a specific policy. On the commissions tab on a policy, you can see a summary of your actual and projected commissions. To summarize your recent commission activity, you'll see commission details at the top of payment history on a policy. Find below details for how these details are calculated. Count of payments received vs. expected from policy effective date to the previous month - using bill from date. Expected payments uses Commissions Frequency. If a term date is entered, number of expected payments is calculated using effective and term date. Projected Commissions Current and Next Year Projected: Anticipated future commission amount for the current calendar year and next calendar year. The Projected Commission tab includes the summarized data from payment history plus a few additional details. Last 12 Months Actual: Commission received for 12 previous months, using bill from date. Last 12 Months Expected: Commission expected for 12 previous months. Actual vs. Expected - by Coverage type.